That title kind of sounds like a kids book title…perhaps I should write one..? Anyhoo, you may have seen my post about my “Magical Mini” sessions. Sweet little Charlotte (and her mom and dad) were the first to experience the magical tree. Charlotte’s look of delight and wonder was so special to see, it’s honestly my favourite part of these sessions. The lovely thing about lifestyle photography, is how unique each of these sessions have been. 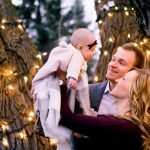 Yes, they all involve the tree in some way, but the mood, and spirit of each of these sessions varies dramatically for each family. I’m excited to share more from this series in the coming weeks.